The Asus K52Jr-X2 Laptop is probably one of the best Asus notebooks yet. It is definitely a high end laptop with 4Gigs of RAm and awesome 600+ Gigabytes of hard drive. If that is not awesome then what is. Though I do not know yet if this is available in the Philippines, you can check ASUS Philippines for that, I find it really a cool notebook. The price range according to CNET and other reliable resellers ranges from $795.00 - $899.99 and that would be around P50,000 to P65,000 in the Philippines considering the added costs. The Asus K52Jr-X2 has a 15.6 in TFT active matrix plus its feature includes a LED-backlit, Zero Bright Dot, and ASUS Splendid Video Intelligence Technology. On vendors shelves this laptop is tagged as a gaming laptop because of its high end features. The Asus K52Jr-X2 is powede by Intel Core i3 I3-350M processor Dual Core. 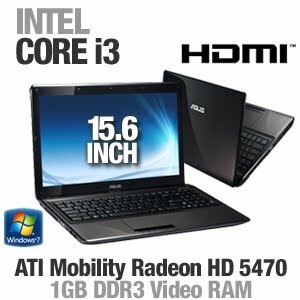 The laptop also comes in with a DVD±RW / DVD-RAM, a 4-in-1 card reader plus a new multi-touch technology. Wow this is really awesome and I hope that I can afford to have it. If you are not yet convinced then check this video first look and demo from TigerDirectBlog.